Well, I guess my blog was tagged by Garrett and Carol. So at the risk of boring you all to death, here are my answers to a set of questions with a list of 8 things. 8. Is wine a food? 2. Bought myself a guitar! And tried to remember some cords and finger picking. 3. Talked on the phone with a prospective Shetland ram lamb buyer - yay! 5. Fed the sheep and chickens - twice. 7. Made plans for tomorrow's breeding ram exchange. My two adult BFL rams are leaving and I will be bringing back a polled black gulmoget ram to use on my Shetland ewes. The girls will be ever so happy. 8. Time to felt, paint, garden, knit, etc., etc. 4. Hoof trimming -- husband is the only one who will help me with that. 3. To put fencing and a well on our 40 acres so we can pasture beef over there. 5. That our youngest boy gets through college without me having to take out another big loan. 6.That we are able to navigate through these dire economic times and see real estates prices get better again so we can move onto our 40 acres. 7. Maybe some grandchildren some day - not TOO soon, but someday. 8. Good health to enjoy my animals and art for years to come. 8 People I’m Tagging : I think most of the blogging people I know have already been tagged, but here's one more to add to the list, Terri D.
My, oh my, Pumpkin Pie! I made homemade pumpkin pie yesterday. Yummm! It's my favorite. I bought some pumpkins for decorating in front of the house in October (my seeds didn't sprout this year in the garden). I put them with squash and corn stalks from the garden for a fall display. When the cold temps and snow came around this past week, I figured it was time to move into holiday decorating mode and bring in the pumpkins before they froze solid. BUT, we all love pumpkin pie in this house. And since I paid for those pumpkins, I figured we were entitled to claim one for ourselves. SO, yesterday I cut one up and cooked it...the chickens got the insides, they love it too. You can see it's only one and half pies now. This is definitely not good for my weight reduction goals! Mix together in a small bowl with a fork: 1 1/2 Cups flour, 3/4 tsp salt. Cut in 1/2 Cup shortening (or lard) and 1 Tbsp. butter. Sprinkle over this 4 or 5 Tbsp milk. Mix into a ball with fork. Roll out, and place in pan, crimp edges. This is enough for a two crust pie, you can freeze half for later use if desired. Combine in a large bowl and beat well: 3 slightly beaten eggs, 1 Cup sugar (1/2 white, 1/2 brown), 1/2 tsp salt, 1 tsp cinnamon, 1/3 to 1/2 tsp Allspice. Add 1 1/2 to 2 Cups mashed pumpkin, 1 Cup Milk (or evaporated milk). Beat well. Pour into pie shell and bake at 450 degrees for 10 minutes. Lower heat to 350 degrees and bake another 45-60 minutes. Pie is done when knife inserted in the center comes out clean. I hope everyone has a good Thanksgiving! Well, I've finished the first three days at my new job. I have three days off before I start in on four days in a row next week. I've never done food service work before, except a few volunteer shifts at church funerals. It's actually kind of fun and I'm learning some new tricks about presentation. I've always been a bit shy about having people over for dinner, or bringing my salad to the salad luncheon and getting most of it back. LOL. So this could be a good learning experience for me. I've enjoyed seeing lots of friends and acquaintances as they come into the store to shop. It's so much nicer than working in a town 25 miles away! I thought the spinners and art lovers among you might enjoy this video of a truly lovely piece of art. The link was shared with me through the feltmakers list. If you're not on dial-up, I hope you enjoy this. Well, things are looking a little brighter these days. I finally got a job and I'll start next week. I'll be working part time in the deli department of the grocery where my husband and son already work. I'll be working three 6-hour shifts per week. To be only 4 miles from home and working short shifts will be great during lambing next spring. And I think I'll actually get more artwork done when I have a part time job. I'm really more productive when I have limits set on my time. We'll see! 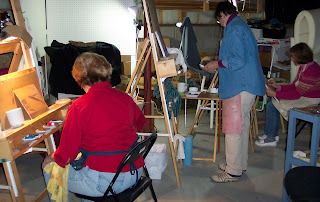 Last week I started a new painting class taught by Karen Kiefer. She lives in Ogilvie, close to our 40 acres. I finished a wool painting and took out my watercolors last weekend and start to paint some sheep. On the right is Lanora, a BFL and on the left is Delia, a Shetland Mule. I have a long way to go on these and I will probably switch to pastels. In the class I'm using pastels. Yesterday I started a pastel of Boggart's impressive skull/horns in class with special lighting set up. Having been bumped and bruised by those very horns (much to sweet old Boggart's embarrassment), I wanted to portray their strength and magnificence. They are so impressive, but it's kind of ironic that I'm now breeding for polled Shetlands. And this morning I said goodbye to Bramble Jemma and River Oaks Abby. They are going to be spoiled rotten at their new home in Princeton. They will join a small flock of just pair of Shetlands right now. I hope to get updates on them and the lambs they produce next spring. They are both such sweet girls. So I am now down to only 6 Shetland ewes and 4 Shetland rams (two of which are going to slaughter due to tight horns). I have 6 Bluefaced Leicesters (soon to be 5 when Dougal leaves), 7 Shetland Mules, and the Ile de France/Dorset ram lamb. Oh yes and 3 crossbred polled rams that will go to slaughter too. So I'm down to 27 sheep right now and should be down to 21 for the winter. I think 15 sheep would be ideal for our limited pasture here. I still would like to sell the two nicely horned ram lambs and a one or two Shetland Mule ewe lambs. My purebred BFL breeding group is together as are the Shetland mules and Granite. I was disappointed that my Ile de France/Dorset ram lamb just wasn't mature enough to use for breeding this fall. I'll have to keep him for next year, but I know it will be tempting to put him in the freezer next spring, they grow so fast! The election is over and our nation has turned a historic page. The scenes of joy and hope have been so moving, I don't remember ever being so emotionally affected by a presidential election. Hopefully we will see a new sense of cooperation and working together. Heaven knows we need it! I first noticed the old Momma kitty grooming her two year old son and I ran to grab the camera. Then it was his turn to return the favor..... It's too bad you can't hear the purring here... Oh that felt good! Maybe a just a little more... And finally two nicely groomed, contented kitties! Yes, I voted this morning -- along with my husband and our youngest son. I was so glad to finally get to vote! This historic election and the economic meltdown has left me very anxious lately. I know firsthand how tough it is for people to get by these days. Hopefully we will have better days ahead of us. Now I want to do some felting to pass the time until the results come in tonight. I bought some dyed merino/tencel braids this weekend at the Wisconsin Spin In. I also got some silk noils and dyed angora locks for embellishing my felt pieces. I had a wonderful time at the Wisconsin Spin In, it was nice to have a distraction from all the political stuff. The pace all weekend was very relaxed. Thanks so much to Terri Drimel for inviting me to join her. We had interesting conversations during the 6 hour drive there and then 6 more on the way home. I live an hour from Terri's place. So I didn't get home until after midnight on Sunday. We were happy to see Shel Gooch and Laura Matthews there. Terri bought a Patrick Green drum carder from Susan's Fiber Shop, what a lucky girl! We played around with it Saturday night and on Sunday morning she took a drum carding class with Carol Wagner. She made some really cool multicolored batts in class. I took the knitting Shetland Lace class with Hazel Carter on Sunday morning. I got to see the wonderful Shetland lace pieces of Hazel's that were included in "A Gathering of Lace". What fabulous work! I bought Hazel's book, "Shetland Lace Knitting from Charts", what an honor to learn from such an expert lace knitter. After lunch Terri and I attended the Spinning Icelandic Wool class. 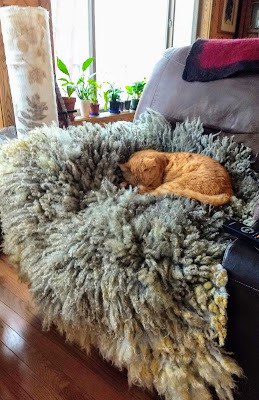 I was amazed at how soft the Icelandic fleece was. The first thing we did was separate the thel from the tog and then we spun it up. I have to say though, the tog spun up was really coarse - I threw mine away. The thel is very similar to Shetland - nice and soft, but it was a little short. When we carded up both layers of the Icelandic fleece together, the resulting lopi style yarn turned out very nice. I'm going to have to finish it up. I did up most of our apples last week. Two batches of apple crisp and 20 pints of applesauce. And there were plenty of apples left for the sheep. The BFL's love apples. Every morning after I put out the hay, Lanora stands by the fence calling for me to get her apples. A few of the Shetlands like the apples too, but Lanora never lets me forget to dole them out. I noticed a good recipe from Michelle on her blog. 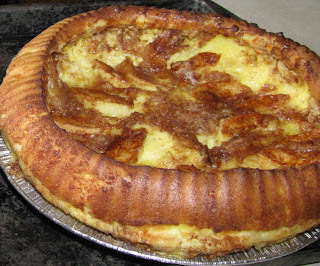 Here is a favorite of ours, apple panakuchen (I'm not sure how to spell it actually). It's very easy to make out of things that are usually on hand in and it's very good for breakfast or brunch. Peel core and slice 1 apple. Arrange slices in a circle on top of mixture. Mix together 1/4 C sugar and 1 tsp. cinnamon, sprinkle over apple slices. Bake at 425 degrees for 25 minutes. Serve warm with syrup. Yummm!